This time last week we were spending our final day with new friends at WAYout Arts. Frank was working with many of the guys on projects and being Frank made sure nobody was disappointed. You can read about Frank’s experience on his blog, a 3 part account, starting here ‘Wi Lek Wi Salone‘. 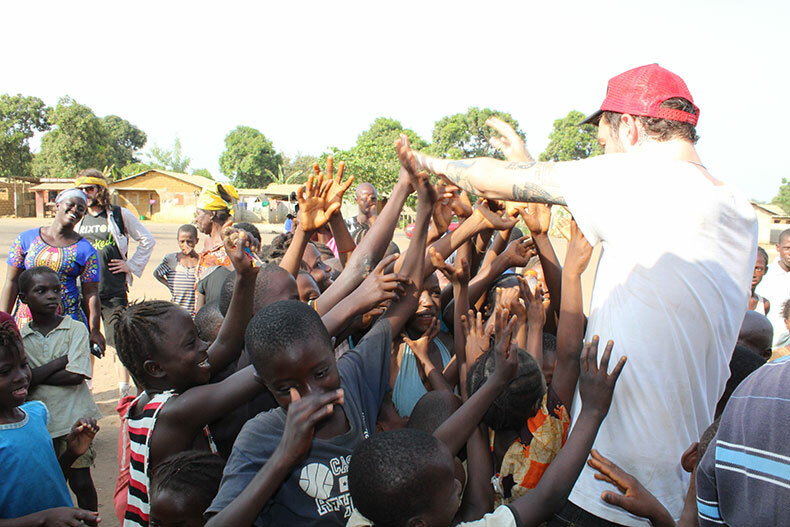 Although the expedition to Freetown was funded exclusively by the Joe Strummer Foundation we had a fundraising campaign running prior to, during and for a few days after we returned. The idea was to raise £2,440 to raise funds to buy replacement instruments and studio equipment – we ended up raising £3,439!! We have seen first hand just how hard things are in Freetown and really would like to thank you to everyone who donated to this campaign, your funds will really go a long way to help to transform people’s lives. Prior to the trip, during and after Frank Turner has been the perfect ambassador for the Joe Strummer Foundation and we thank him and indeed Ben Lloyd (Sleeping Souls) for their dedication and flying the flags for WAYout (Worldwide Arts For Youth) and the Joe Strummer Foundation so high. Since we returned I’ve been thinking about the people we met a lot and how fantastic a job Hazel Chandler, co-founder of WAYout Arts, and the WAYout team are doing in very trying circumstances. They made us feel so welcome and are now in our hearts. Special thanks to Gibo, Josta, Alusine, Mash P, MSK and John for looking out for us, nothing was too much trouble. We had a fantastic update from Hazel today which proves that the trip was a success. Mash P went on the radio with his new track “After The Jungle”. People loved it. They wanted to hear more of his story and he was able to talk, live, about his experiences. This was a first for Mash. He never wanted people to know about his rebel past. So a big step forward for him and one enabled, in no small part, by Frank’s involvement in the track and acceptance of his past. Three young guys walked in WAYout from Moor Wharf. They were welcomed and shown around and looked like they had won the lottery. Word of mouth or a radio broadcast would not have brought them in. Us turning up in their community broke the barrier that then enabled them to turn up in ours. A further three guys from the Iron Team who live in Ferry Junction also walked in (it’s a long way), they wanted to thank Frank for coming and that it meant so much the community as nobody ever comes to visit. They wanted to organise dates – Saturdays and Weds mornings were approved for going there with guitars, laptop and camera. And a massive shout out to Dave Danger for all his help and support from the start and everybody who has thought about our trip, followed our journey online and indeed donated to what is undoubtedly a remarkable cause.